Today I wanted to take some time to acknowledge all of the "fathers" in my life. Many times, fathers are the unsung heroes of the family. Many times, they aren't present much at all. I have been blessed to the place where this wasn't the case in my life. I'm very grateful for that. 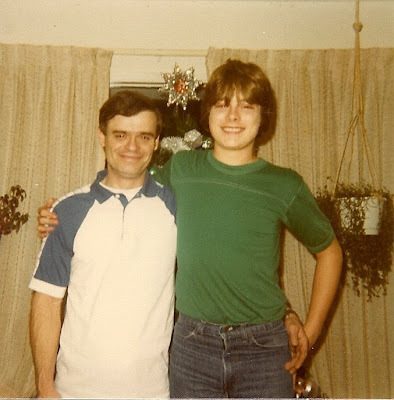 So, please, journey along with me today as I remember the special "father's" in my life. 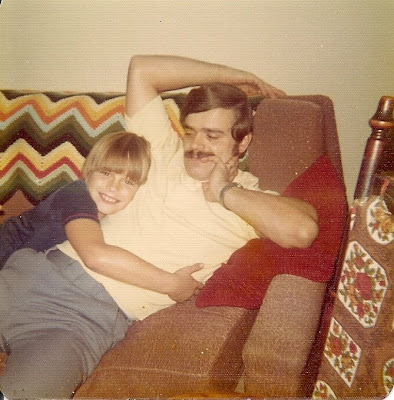 This is me and my papaw - my mom's dad. He was a real hoot. He was one of those West Virginia coal miners I told you about. And, yes, he had black lung, too. His health was very poor for most of my life. Him and Granny lived in a delightful little house out in the country. They had a huge tree with a wooden swing suspended from each side. After a long day of mowing grass, they would sit on those swings together and drink lemonade. Sometimes, Papaw would let us grand kids mow the lawn on the riding mower. That was always such an excitement for me. He didn't appreciate the time I mowed down his huge patch of asparagus, though. Hey, I thought it was weeds! It was separate from the rest of the garden and I didn't realize the difference. I didn't know that it takes up to three years for the green spears to grow, either. Oops! 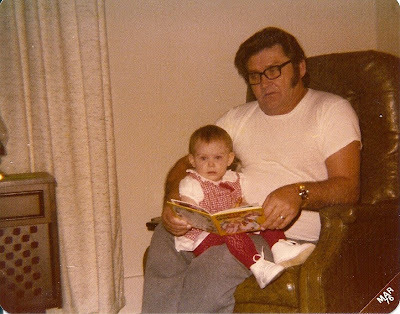 Papaw had speech difficulties later in life and was wheel chair bound due to strokes. Every Friday night the whole family would go out to eat together. First, Papaw liked Ponderosa. After years of eating at Ponderosa every night, you could say I got a little tired of it. Actually, I still don't like to eat there. I was overjoyed when they finally built a mall in our town. Our new Friday night hang-out became the food court. Papaw liked to make a 'run for the border'. 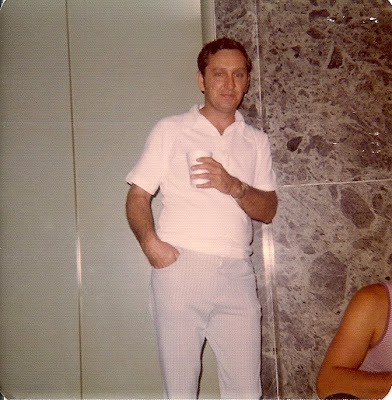 Papaw also liked to socialize - a lot. He loved to hang out in the food court and talk to everyone there. It was kind of comical because he was a lot like having a toddler. You know how when you have a baby and that little darling child gets old enough to begin building a vocabulary and they talk and talk and talk? Oh, how they love to talk! Except, no one but you can understand them? And you have to translate everything your little tyke says to everyone because they smile and nod so sweetly while your chatty bundle of joy is sharing all of life's adventures with them? And then they look at you - still smiling - but with a really confused look on their face and a pleading in their eyes that is crying out, "What did your toddler just say to me?" Well, that is precisely how it was with Papaw! He would talk to everyone, I mean everyone around. Then we would have to translate. He liked to aggravate us kids, too. He was always coming up with nicknames or phrases or new ways to tease us. He loved fishing. He had a little flat bottom boat we called the "Lettuce Leaf" because it was green. He also made his own fishing lures for therapy later on in life. 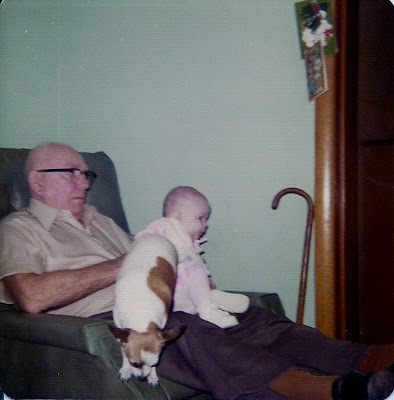 I have many, many memories of this papaw. Too, many to share today. 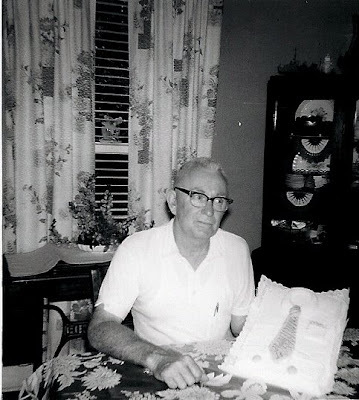 This is my other papaw - my dad's dad. Sadly, I don't have very many memories of him. He, too, was a West Virginia coal miner - the kind that stayed there. He was a supervisor in the mines and my dad told me how he used to love it when Papaw would take Dad with him to check things out sometimes. Sometimes Papaw even went on horseback! I think I was 4 when he died. My mom told me he was in heaven. When I asked her what heaven looked like she told me that it was very beautiful and had lots of pretty flowers. So, when we got to the funeral home, I told everyone that it was heaven. After all, Papaw was there and there were lots of pretty flowers! I'm sure it made lots of sense in my 4 year old mind. This is my Dad waiting for me to be born. He is the only "Papaw" that Little Britches will ever know here on earth. He is one of the most generous, kind hearted people I've ever known. When I was younger, Dad was layed off from Ford. I mean, like 3 years layed off from Ford. He couldn't find a job for anything. The economy in Michigan in the early 80's was in bad shape - probably about like it is now. He did any kind of odd job he could to make end's meat. It had gotten so bad that he was ready to head to Texas to find work when Ford called him back up. Even in those lean years, though, we never went without. Dad is very resourceful. We couldn't afford new bikes for me when I would out-grow mine. But, that wasn't an issue for Dad. He would find old bike parts, sand them down, paint them and put them together, add a new seat and a couple of other new parts and I would have me a brand new, one of a kind bicycle that was the envy of ever kid in town! Seriously. This red one he made me was stolen out of my fenced in back yard 4 times. Four times! The last time we had to go pick it up at the police station. We were gone once after that and the same kid that had stolen it before was trying to swipe it again, but he got caught. By Samantha. Samantha was my very best BFF who lived across the street. Do your kids every watch i Carly? Well, my Samantha wasn't too unlike that Sam. You just didn't want to mess with her much. My Samantha saw that boy taking off down the street with my kickin' red bike that Dad had pieced together for me so she did what any good BFF would do. She chased the boy down, beat the crap out of him, and brought my bike back to my house. Funny, he never tried to steal it again! So, anyway...Dad was very resourceful. Not only could he build bikes - he could build anything. He still can. 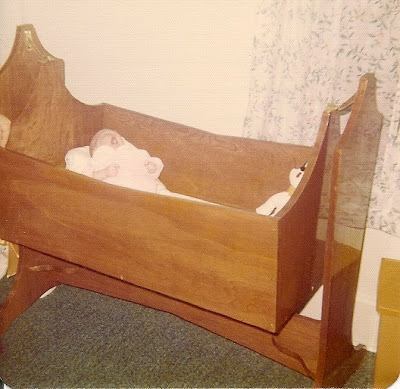 He made this cradle for me when I was born. I slept in it. Although, I don't look too happy to be in it here. :0) My son slept in it. One day, my grand babies will sleep in it. Even during the lean years people had it much worse than we did. 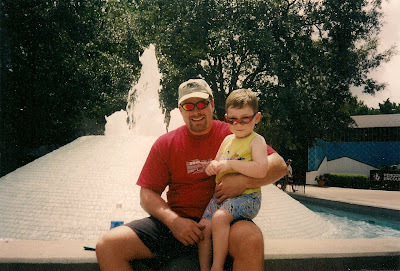 Dad has always had a soft spot for kids. So, when the kids from around the corner would come to play and didn't even have shoes for their feet, Dad would say something to me like, "Pam, you've got extra shoes (or coat, or whatever) and these kids don't have any. Why don't you find a pair that you don't wear much and give to these kids so they'll at least have shoes (or coats, or whatever)?" And that's what we did. Even if we didn't have extras, we usually at least had popsicles. So, sometimes that is what they got. But, they always got a piece of my Dad's heart. Not only can my dad build bikes, and cradles, and whatever else he decides he wants to build, but, he's a pretty mean cook, too! And he can't stay out of the kitchen 'doctoring up' whatever someone else is making. This also applies to school projects like the musical instrument we had to make in elementary school. What started out as, "Dad, I have to make a project for school. I want to make a guitar. Can you put some nails in a board for me and then I'll attach some rubber bands to it?" turned into an actual wooden guitar with frets, pegs and wire strings (that I had practically no part in)! He just couldn't help himself, gosh darn it! He gets so excited when it comes to building things. He got an 'A' on my project though! It still hangs on the wall in their basement. He is also a huge practical joker. 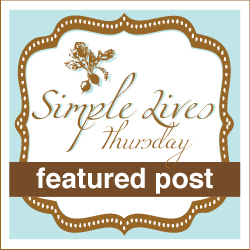 Gosh, I should write another post just on that topic! 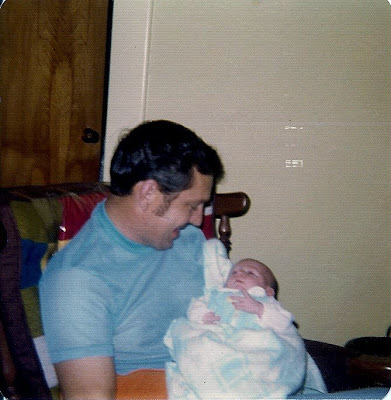 The stories could go on and on about my dad, but I wouldn't have room to write it all. This is my husband and his dad. I never had the pleasure of meeting him. He died waaaay to early. From the stories I hear he sounds a lot like my dad. Actually, my husband says that my dad reminds him a lot of his. He was a butcher and liked his meat! I guess he could really pack the food away. He never gained an ounce. Everyone always talks about his famous 'cannons'. I guess his biceps were huge. They say it looked like you set an apple on his arm when he flexed his muscles. He was also a very affectionate man. His sons kissed him on the lips until the day he died. I'm thankful that he passed this on to my hubby. I love hugs and kisses. It's also something that MW is most thankful for. He said there was never any doubt about how much his dad loved him. That is a legacy worth passing on. My MIL always says how much MW reminds her of his dad. Out of their two boys, he is most like him. She says that the older MW gets, the more she sees his father in him. He must have been an awesome guy! This is my husband. He is the father of our son. He is the most important male figure in Little Britches' life. That boy is his pride and joy. He is very aware of how short life can be and has determined to make every minute with Little Britches count. MW works in a business where they do emergency service. Somtimes this means late nights and weekends. It means he doesn't always get to spend the time at home with his family like he would like to. But, he makes the most of the time that he does have. Once a month he has to work on Saturdays in the office. He takes Little Britches along with him. This has become one of the highlights of the little guy's month. He loves getting to spend some 'guy time' together with his dad. MW is very fun loving and affectionate, like his father. He is passing this trait on to our boy. I see so much of MW in Little Britches. They have 'the dance' they do together. And MW is training Little Britches in all the ways to be a good man. He's taught him important things like always opening the door for a lady, whether it be car or other wise. He' also taught him other things like the proper way to grab a heiny - with the clear instruction that this is not to be done until post-marriage! There is a lot of heiny grabbing going on in our house! He's not only teaching him hands on life skills like mowing grass, helping build things...He is teaching him the most important things in life like, seek God first, do the right thing even when it's not the easy thing... For this I am thankful. MW was always very much into sports. Little Britches, not so much. He's more of the artsy fartsy type, like me. As much as MW would love to be able to take the little guy out back and throw the softball around - it just ain't happening. Actually, Little Britches is wired in such a way that if you try to force him into something he completely rebels against it and shuts down. But, if you keep throwing it out there, he'll eventually come around in his own time. Take fishing, for instance. MW has tried to get the boy to fish for years. He's had absolutely no interest what-so-ever. Until all of a sudden. They went fishing together a couple of weeks ago and now Little Britches can't wait to go fishing with his 'Poppa' again. It's been like that with everything with him. One of the things that I appreciate about MW is that he recognizes that him and Little Britches are not the same person (even though he is Mini Me is so many ways). He has told me on more than one occasion, "Yeah, I would love for him to be into sports like I always was, but I don't want to push him into something that he isn't wired for. More than anything, I want him to be who God wants him to be - more than who I want him to be. I trust God that he will work it all out." That makes me feel so good as a wife and mother. I am confident that when Little Britches is a grown man with children of his own he is going to look back at his life and remember the legacy that his father passed to him. He will remember that no matter what was going on in the world, our house was a refuge from the storm, a house filled with lots of love, lots of laughter, and a father who loved him unconditionally. So, today I want to say thank you and Happy Father's Day to my husband and my dad. Thank you for a home filled with love. I love you guys! Happy Father's Day to your hub and your dad. My grandpa was from West Virginia, but moved out to California in the 1960's for a job. Good news: You've won my Lavender Bee Farm giveaway ! 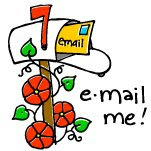 Email me your personal address and I'll get the package out to you right away. That was such a nice tribute! I wish I had all those wonderful memories of our grandfathers. I Can't Believe It! I Won - Again!